Fishermen haye used soft-bodied lures since 1860, when the first rubber worm was patented. But most of the early lures lacked the lifelike action of modern soft plastics because the material was relatively hard by today's standards. 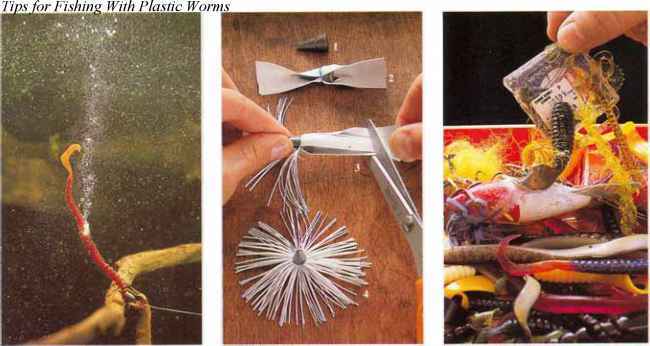 In 1949, an Ohio luremaker began molding plastic worms from a new synthetic material, polyvinyl chloride resin. Bass fishermen who tested these lures soon reported fantastic results. Because the worms were so soft, they flexed with each twitch of the line, resulting in an inresistible action. The popularity of soft plastics has skyrocketed since those early years. Most tackle stores now offer a wide selection of soft plastic worms, grubs, crayfish, shrimp, frogs, snakes, lizards, salamanders, salmon eggs, and adult and larval insect imitations. 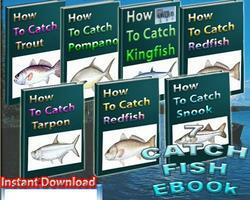 Today, fishermen use soft plastic lures for virtually all spe cies of gamefish. Soft plastics offer several major advantages over hard-bodied lures. 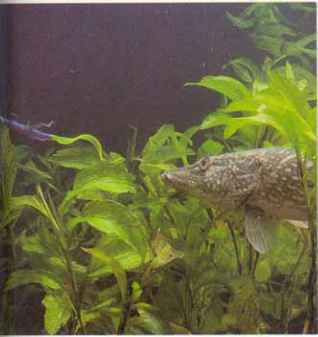 A hard-bodied artificial does not have a texture like real food, so fish may immediately recognize it as a fake and eject it. If you do not set the hook instantly, you will probably miss the fish. But a soft plastic has a lifelike texture, so fish will mouth it an instant longer, giving you extra time to set the hook. Many soft plastics can be rigged with the hook point buried inside where it cannot catch on obstructions. This way, a soft plastic can be retrieved through dense weeds or brush, or over rocks and logs with practically no chance of snagging. Yet the point will penetrate the soft materia1 when you set the hook. Another attribute of soft plastics is the ability to absorb scents. You can treat soft plastics with bottled fish attractants or buy them with scents molded in. 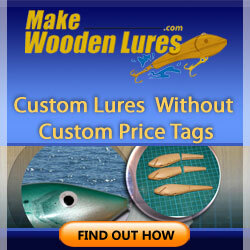 Scents quickly wash off hard-bodied lures, but soft plastic holds scent much longer. Often, soft plastics look almost exactly like natural fish foods. Legs, feelers, and even minute details like scales add to the realistic appearance. Many have translucent bodies which allow light to pass through, much as it passes through common foods like baitfish, worms, shrimp, and insect larvae. 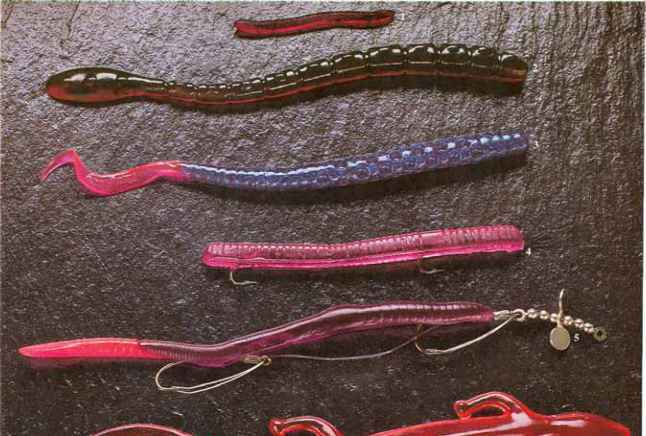 Modern soft plastics vary in hardness from almost jellylike to relatively firm. The softer lures look and feel more natural to fish. But the harder ones are more durable, and stay on the hook better, especially when fished in snaggy cover. Most manufacturers use a plastic between these extremes. To cast the smallest soft plastic lures, you will need light spinning tackle with sinkers or a plastic bubble. Or, yon can use fly tackle. To cast plastic worms less than 6 inches long, light spinning tackle and 4- to 8-pound mono usually work best. For larger worms with exposed hooks, most fishermen prefer spinning or bait-casting tackle with lines from 8- to 15-pound test. For larger worms with hooks buried in the plastic, use bait-casting tackle with lines from 12- to 25-pound test. Some manufacturers make powerful rods, called worm rods, specifically for driving the hook point through a soft plastic lure and into a fish's jaw. When working soft plastics through weeds or brush, use abrasion-resistant line. Plastic Worms or flooded timber. And if the worm does become snagged, you can break it off and tie on a new one for only a few pennies. Color is an important consideration in choosing plastic worms. Opinions differ greatly, but most largemouth bass fishermen prefer purple, blue or black worms. Other popular choices include red, green and motor oil. Motor-oil worms change color as the light strikes them at different angles, much the same way a film of oil on water changes color. Metal-flake and fire-tail worms often draw more strikes than worms in solid colors. BASIC STYLES of plastic worms include (1) short, thin- bubbles in the water; (4) pre-rigged worms; (5) pn bodied worms used mainly for panfish; (2) standard rigged worms with spinner blades; and (6) lizard-lik worms for larger gamefish; (3) worms that release air worms with arms and legs. auger-tails sink more slowly than other worms. Paddle-tails have a good swimming action when fished with a jigging retrieve. Straight-tails have less action than other types. They work best for tying threaded multiple-hook rigs (page 83). Size of the worm depends not only on the species of fish, but on the time of year and the water clarity. Small worms usually work best in spring, before the water warms. Larger worms are a better choice in summer, when fish become more active. Small worms are generally best in clear water; larger worms in murky water. Buoyancy can also be a consideration. A worm that rides above bottom is easily visible to fish and less prone to snagging. And, you need the buoyancy when floating a worm on the surface. Most plastic worms will float, but many are not buoyant enough to float when rigged with a worm hook. When flotation is important, use a worm made from highly buoyant material or one with air pockets molded in. 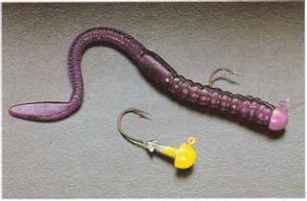 Most plastic worms come without hooks, so you can rig them to suit your fishing situation. A few worms come pre-rigged with a monofilament hook harness threaded into the body. This type of rigging works well when fish are striking short. But pre-rigged worms snag easily and generally lack the action of other worms. When rigging Texas-style, choose a hook with a long, sharp point that will easily penetrate the worm. The shaft must be bent at the proper angle for good penetration, and should have barbs or sharp bends to keep the worm from sliding back when you set the hook. With a Carolina rig (page 83), use a plain, straight-shank hook; a hook with a light wire weedguard; or the same type of hook used for Texas-style rigging. Popular tail designs include (1) curly tail or twister tail, (5) skirted tail, on tube-style wonn. POPULAR HOOKS for Texas-style rigging include: (1) Eagle Claw 95 JB. you can also rig a wonn on a weedless VMC Faultless, (2) Lindy Sure-Lok, (3) Worth Wonn- hook like the (7) Eagle Claw 449 WA. Special hooks are Loc, (4) Tru-Tum 772, (5) Mister Twister Keeper, and (6) unnecessary when rigging with the hook point exposed. A hungry largemouth finds it difficult to resist a plastic worm squirming seductively through its underwater hideout. Plastic worms appeal most strongly to largemouth bass, but also work for small -mouth and spotted bass, sunfish, northem pike, walleyes and even brown trout. Worms used for sunfish usually measure 2 to 3 inches long; for smallmouth and spotted bass, walleyes and brown trout, 4 to 6 inches; for most largemouth bass, 6 to 8 inches; and for northern pike and big largemouths, 9 to l3 inches. For bass and sunfish, plastic worms work best starting when the water temperature reaches 60F in spring and continuing until the temperature drops below 60F in fall. Worms remain effective at cooler temperatures for most other species. Fishing with plastic worms bears many similarities to fishing with jigs. Pish usually grab a plastic worm as it sinks, so yon need a sensitive touch to detect a strike. You must keep your line taut as the worm drops, or strikes will go unnoticed. The way you rig your plastic worm depends on the fishing situation. 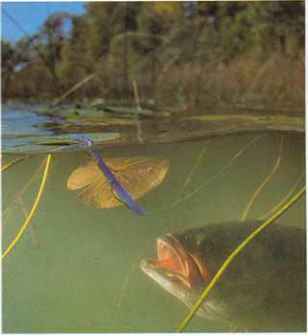 Por fishing in weeds, brush, timber, or other dense cover, rig your worm Texasstyle. Because the hook point is buried inside the plastic, you can retrieve the worm over obstructions without snagging. You can also rig your worm on a weedless single hook when fishing in heavy cover. Because the point is exposed, you can set the hook more easily. But worms rigged this way catch more debris than those rigged Texas-style. When snags are not a problem, thread your worm on a jig head with a barbed collar, or use a multiple-hook rig. The exposed hooks will improve your hooking percentage. The Carolina rig is a good choice for deep-water trolling. The swivel prevents the line from twisting as it would if yon trolled with a Texas rig. 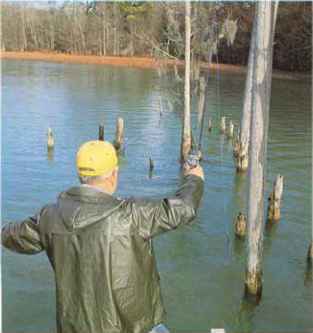 When rigging Texas- or Carolina-style, use a hook from size #2 to 1/0 with a 4-inch worm; 1/0 to 3/0 with a 6-incb worm; 4/0 or 5/0 with an 8-inch worm; and 5/0 or 6/0 with a 10- to 13-inch worm. A common mistake in rigging plastic worms Texasstyle is to use too much weight. A worm slithering slowly draws more strikes than one sinking rapidly. With a standard 6-inch worm, a 1/8-ounce sinker is usua1ly adequate at depths of 10 feet or less. Seldom will you need a sinker weighing more than 1;4 ounce. When trolling with a Carolina rig in deep water, use a sinker of y2 ounce or more. Inexperienced worm fishermen often use rods that are too soft, so they fai1 to set the hook hard enough. To drive the hook point through the plastic and into a fish's jaw, use a stiff graphite or boron worm rod. When you detect a strike, lower the rod tip and reel up the slack rapidly, then set the hook as hard as you can. Expert fishermen often set the hook two or three times to make sure it sinks in. How to Tie a Multiple-hook Rig protruding. (4) Twist the hook one-ha1ftum. 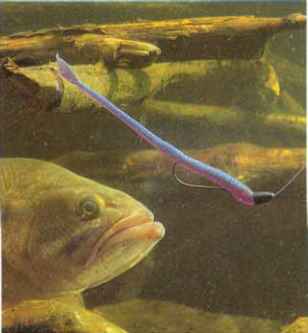 (5) Push the hook into the worm until the point a 1 most penetrates the opposite side. The rigged worm should hang straight with no kinks or twists. out a hook's length behind the head. (6) Pull the rniddle hook into the worm, then nail-knot a third hook to the mono; trim. (7) Push the hook, eye first, into the hole, then up to the tip of the head. The mono inside the worm should be taut, but not tight enough to kink the worm. MAKE a Carolina rig by threading a buoyant worm onto a barbed-shank hook, leaving the point exposed. Or, use a worm hook and bury the point. Tie the hook to an 18- to 36-inch leader attached to a slip-sinker rig. THREAD a worm onto a lead jig head with a strongly -barbed collar. Push firmly to snug the worm against the jig head so there is no gap. Mushroom-head jigs work especia11y well for this type of rigging. HOp a Texas-rigged wonn through timber, brush or dense weeds. If the wonn catches on an obstruction, twitch the rod to free it. To prevent the sinker from sliding away from the wonn, peg the sinker in place by wedging a piece of toothpick into the hole. FLIP a Texas-rigged worm so it lands alongside a tree trunk or in any hard-to-reach spot. Keep your line taut as the wonn sinks and be ready to set the hook at any sign of a twitch or pause. When using this technique, most fishermen prefer a stiff rod about 71/2 feet long. 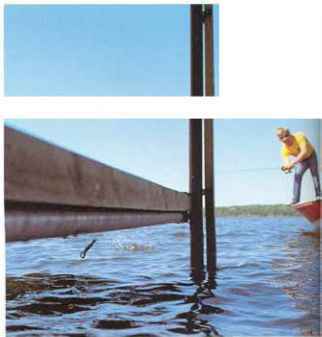 SKlP a plastic wonn under a dock or other overhanging cover to reach bass hiding in the shade. Keep your rod tip low, then snap your wrist sharply. To avoid a backlash when the worm hits the water, use spinning instead of bait-casting tackle. 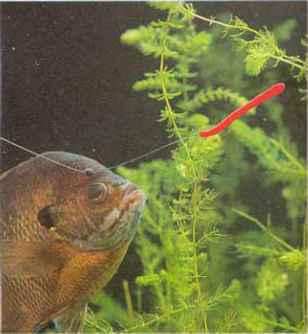 RETRIEVE a 2- to 3-inch plastic worm along the edge of submerged weeds or over weedtops to catch sunfish. Use a #6 or #8 hook and leave the point exposed. If the fish are striking short, use a multiple-hook rig (page 83) with two #8 hooks. CRAWL an unweighted plastic worm over pads or other surface vegetation. Retrieve with twitches and pauses. Use a higbly buoyant worm and a small hook for Tax-imum flotation. you may need lighter-than-normalline to cast the nearly weightless rig. RIG a plastic worm on a jig head when fishing over weedtops or along a weedline. If the open hook catches on vegetation, jerk sharply to free it. Use a jig head with a double-barbed collar to prevent the worm from slipping back when you j erk. CUT a small slit in the back half of a plastic worm, then insert a small piece of a seltzer tablet. Bubbles from the fizzing tablet attract gamefish, which then strike the worm. SLOW the sink rate of a plastic worm by (1) filing a groove in a cone sinker. (2) Tie on live rubber, then (3) stretch it while cutting to length. The rubber forms a (4) skirt around the sinker. AVOID storing worms or other soft plastics with painted lures, plastic hook or swivel boxes, or worms of different colors. The resin eats the paint or plastic, and the colors bleed. How to hook a fake worm? What color fake worm to fish? How to texas rig a fake worm? How to tie a hook and sinker? How to hook an artificial worm? How to pre rigged worm? Can soft lure be used as a fake bait? 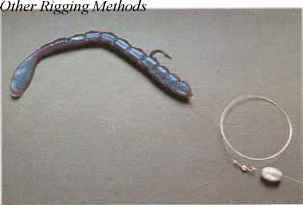 How to rig plastic worms? How to detect strikes with soft plastics? How to hook rubber worm? How to size hooks for plastic baits? How to hook artificial bait? How hard should I twitch a plastic worm? How to rig a plastic lizard? How to rig crayfish imitation? How to rig a soft plastic worm? How to put plastic worm on hook? How to rig rubber worms with multiples? How to hook fake worms? How to bait hook with artificial worm? How to rig a Reaper fishing bait? How to rig a reaper tail?